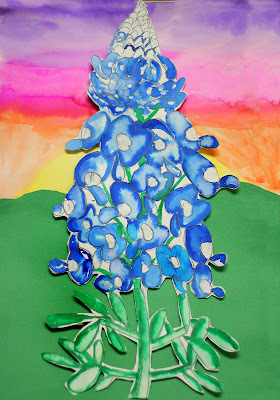 Kinder and first have been learning about Texas, so naturally we painted bluebonnets. I wanted them to learn about making the colors go from dark to light (value) and used the watercolor paper for the bluebonnets. Some made a Texas flag for a background and these students made a sunset. We put peices of cardboard behind them to give them some 3D effect. We talked about foreground, background, horizon line, and value. Students that finished early, drew little bluebonnets in the background. The results were beautiful, and they were excited to take them home!